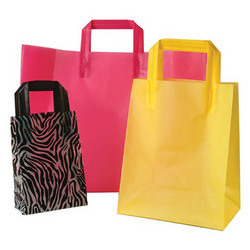 Our domain expertise has enabled us to come up with an excellent collection of Printed Plastic Shopping Bags. The bags offered by us are resistant to water, which can be used even in rain. Moreover, these bags are chemical resistance and are ideal to store various types of things. We also test these bags on various parameters so as to ensure their compliance with set industry standards. Established in the year 2011, we, “Synergie India”, are a trustworthy organization engaged in the business of manufacturing, supplying, exporting and importing a quality-approved range of Woven & Non-woven Bags, Tarpaulins, Polyester Straps and Disposable Items. Under this range, we offer Jumbo Bags, FIBC Bulk Bags, Retail Carry Bags, Woven Sack Bags, Bailing Bags and Disposable Hair cutting Capes. Apart from this, we also offer Disposable Capes, Disposable Gowns, Shoe Covers, Disposable Hair Bands, Disposable Bed Sheet, Disposable Aprons and several more. The entire range of products is dedicatedly manufactured by us by making use of high quality raw material obtained from the most authentic vendors of the market. All our products are developed by making use of sophisticated technology as per the international quality norms and standards. Our quality products also serve to various industries such as Retail Outlets, Beauty Salons, Hospitals, Polyester Fiber, Bailing Plants, Agriculture, Chemical, Hotels, Minerals, Plastic Granules and Garments.